Application monitors data streams from the factory floor to identify key indicators such as performance and profitability in order to respond to the health and maintenance of factory floor machines providing automation and to improve the operational efficiency and lifetime of those machines. 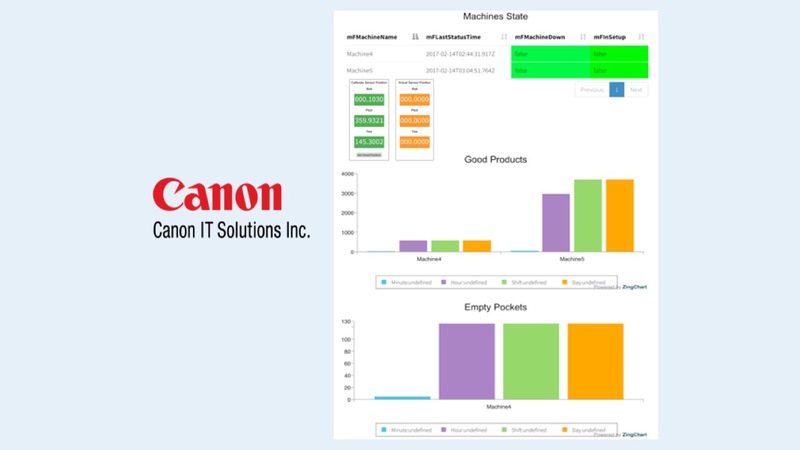 Canon ITS has its own edge computing solution connecting IoT devices and is developing and promoting integrated solutions with the VANTIQ platform for manufacturing customers. Factory automation and smart manufacturing projects need tailor-made software to most effectively monitor factory status and enable powerful human-machine collaboration. Canon ITS chose VANTIQ as the core platform it uses primarily because of the speed with which it can build smart manufacturing systems. Clients of Canon ITS radically transform their manufacturing processes from batch to real-time, significantly increasing throughput and quality. Click here to read the press release of Canon ITS’ application.